It's always an honor to be on someone's mind! I've been thrilled to work with Suquet both as an Interior Designer and now as a Product Designer - they're all lovely humans, and their stock in shop and online is ON POINT. We are SO VERY excited to introduce you all to our latest project here at akHOME! We're FINALLY launching our first line of dishwares, along with a beautiful set of kitchen items!!! The Food Tables are our first venture into #foodfurniture. Two nesting - or stacking - tables to elevate your food at any event, especially weddings! It's been an absolute honor to work with local artisans on this project, including Birdman the Welder and Kristine Weber c e r a m i c s. As a result, every piece is truly one-of-a-kind. And, of course, includes an "artful element" herb leaf to help showcase your delicious edibles! 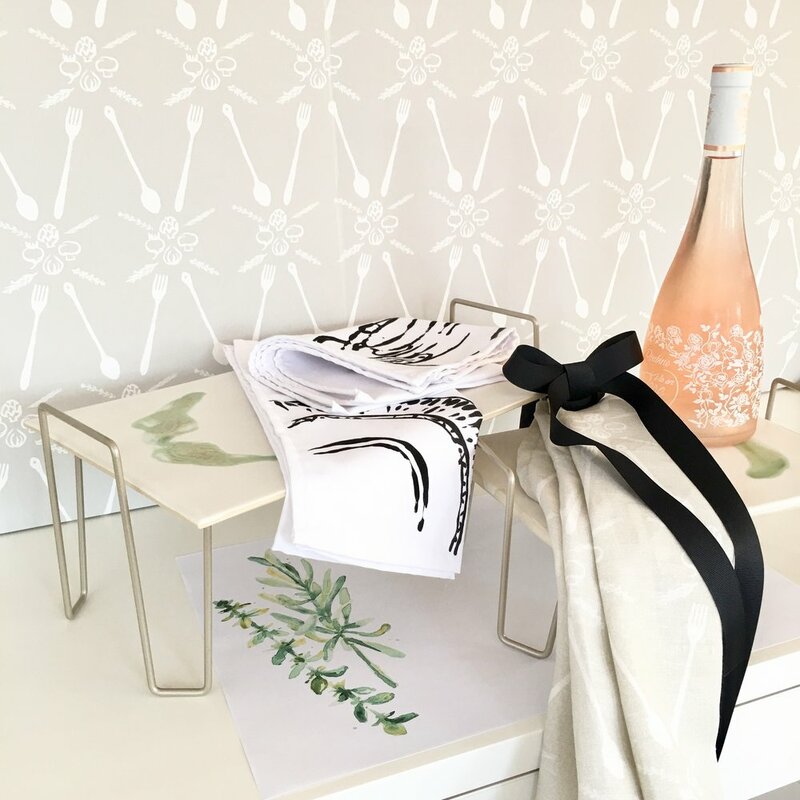 Complimenting our new Food Tables are a NEW Wallpaper art print - the Herbal - which we're already in love with, and have in TWO colors in our own Kitchens :) And a matching Apron, printed in a gorgeous Champagne color, as well as our already popular Vintage-inspired Tea Towels! We can't wait to see how you all ELEVATE your Dining this summer! INTRODUCING | The Cacti Print! I love bringing out new prints!! This bright, colorful one just makes me HAPPY for Summer!!! Introducing the Cacti print - direct to you from my trip to Phoenix, Arizona a few months back :) Yes, many of my prints come from trips around the world, and this one is no exception. Fabrics and ready-made products are avail on Spoonflower.com or Roostery.com as "akHOME" - what can you imagine with this print??! With the help of amazing local fashion designer, Kim Legler, I made a skirt that was perfect poolside in Palm Springs (see below)!! Can't wait to see YOUR creations - be sure to tag #MYakHOME #artfulelements! Shop Local, Be Part of a Story! Probably THE best thing about creating a "thing", is the weaving of story that goes into every piece. While I hope the result is simple to love and appreciate regardless, it's the story that fascinates me deep down. Our Laguna print is one beautiful example! It started on a trip to Paris Fashion Week - I was noticing all kinds of stripes on the runways and wondering how I could re-create this most basic of patterns. When I got back to the Studio I took a simple piece of silk, and drew stripes with a Sharpie. Not fun yet... I played with it and eventually ended up dropping it to see what patterns could be created. VOILA! The spark of an idea! Now these stripes started to resemble waves, or maybe it was because my next trip had been to Maui that struck me, but OBVS now a "watery" watercolor underlay HAD to happen! Meanwhile, an Interior Designer friend had connected me with Healing Waters International / the HER Initiative out of Colorado. I called to chat with the Founder, Kayla Fruchtman, and we wondered how we might one day work together cross-border. As it came to being, this design proved to be the perfect thing to collaborate on - and the name "Laguna" - reflecting bodies of vibrant water running through communities in need - came to being. 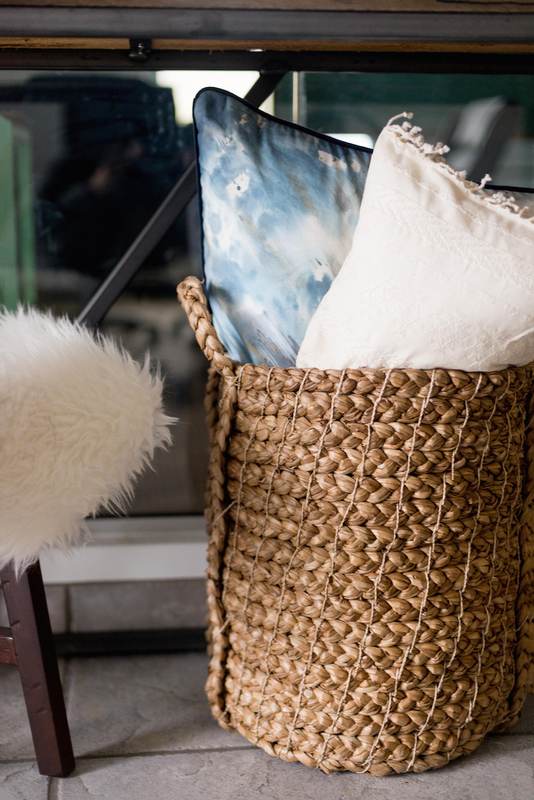 Since then, proceeds from every Laguna pillow sold have gone to help these amazing, generous efforts, and every dollar you shop on this local product keeps this - and the next - story going. Who knew so much went into ONE LITTLE PATTERN?! Turns out the painting is often the easy part - learning Photoshop was the hard part!! But I'm continually learning and creating, and as I do, the stories get more and more interesting. At least I think so ;). You can find these beauts online in our shop and in select stores! This years' theme centers around a GORGEOUS bar cart designed by Interiors and Cabinet designer, Jamie Banfield Design ♥⠀Jamie's beautiful line of cabinetry, The Banfield, features a minimalist look with clean lines. You can definitely see the beauty of them in the custom bar cart, a collaboration he's created specifically for the Daffodil Ball with local creative master Birdman the Welder. And to top it off? SO. MANY. THINGS. ! From candles and feature lighting to set the mood, to vintage crystal to decant those fine wines, from hand-crafted snack bowls to a custom set of bitters, the lucky bid winner of this vignette will not only have a stocked bar, but an amazing conversation piece! Stay tuned on our Insta Stories for more info! We're so excited for Pantone's #coloroftheyear, that we've REVAMPED our Fraser Pillow!! Now featuring 100% Silk SOLID front and a 50/50 Linen/Cotton back, it's definitely upped it's luxury factor! How are you incorporating Ultra Voilet this year? While we don't always follow specific trends, once in awhile they serendipitously match up with colors you already know and love. Just as fortunate - our Laguna Violeta also matches! Quality input, quality output! Silk, Linen/Cotton and satin tags - LOVE! Samples for a project with Becky R Designs. We love working with Interior Designers! Dreamy :) The reversible Fraser + the Laguna match up perfectly! The re-vamped, reversible Fraser and one of our metallic Accent pillows! The Fraser SOLID (shown here) and STRIPE (reverse), as well as the Laguna prints are available as pillows in our online shop, or as fabrics, wallpapers - or even gift wrap - over at Spoonflower.ca. Be sure to tag #MYakHOME on your projects so we can see them! We love purples - this is one trend we can stand behind! WELL, that was so much fun, I think we'll do it again! P.S. Ignore the messy Studio backgrounds - it's a creative space! Featuring Fraser Stripe and Fraser Solid Fabrics - a collaboration with Kendall Ansell Interiors. Featuring Laguna Violeta Fabric and Wallpaper. Yeah, ok. This is just all messy, but I did get some great flatlay pic in between glasses of wine! Featuring Vintage Peony fabric in Black/White (also avail in Grey/White). Cheers! AND featuring Laguna fabric, wallpaper and - the 18" 100% Linen pillow, proceeds of which go to Healing Waters International / the HER Initiative.